One year ago, a new garden appeared in Beavers Bend. It was the first of it's kind, at least for those involved in it's creation. The thought of growing food was never anything more to me than a way of understanding how we get fed. What we were being fed, though, never really crossed my mind. Other than worrying about fat or cholesterol, the life-cycle of a fruit or vegetable never merited any debate in what I chose to eat. Now it's different. Now I know about GMO's and pesticides. I do know the great distances our malnourished food travels as it slowly dies in transit. I know what we all thought was food, never was. So, we built a garden. Living in the Beavers Bend State Park area, just north of Broken Bow, OK, our climate is perfect for an outdoor garden the entire year (covered in the winter). We are also lucky enough to have a great organic farm just a few miles away at Honey Bear Ranch. Honey Bear Ranch in Beavers Bend provides the best quality naturally grown products in the Broken Bow area. They raise their own vegetable plants in the greenhouse so they are sure that no chemicals tough them. 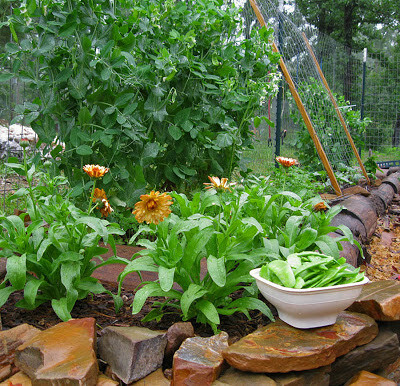 Their gardens are fed with natural fertilizer provided by their calves, chickens and the compost brewed on their ranch. Honey Bear Ranch often have free clinics to teach others how to grow food for their families. They believe it is important to pass on what they've learned from trial and error. They also believe it is wise for all of us to learn to be self-sufficient and to feed our bodies with naturally raised, locally grown food. Don't forget to visit Honey Bear Ranch while visiting Beavers Bend and meet Phil and Sandy. Check out Honey Bear Ranch's website at http://honeybear-ranch.com/ .